If your gracilis muscle is weak, what kinds of performance and health issues can you get? Let’s look at gracilis anatomy, actions, measurement methods along with the implications weak gracilis strength can have on your athletic performance and health. Anatomy – The gracilis is one of the adductor muscles. It is located on the medial (inner) side of the thigh and is the most superficial (towards the skin) of the five adductor muscles. The top of the muscle attaches to the lower front of the pelvis (specifically on the lower portion of the pubic bone). 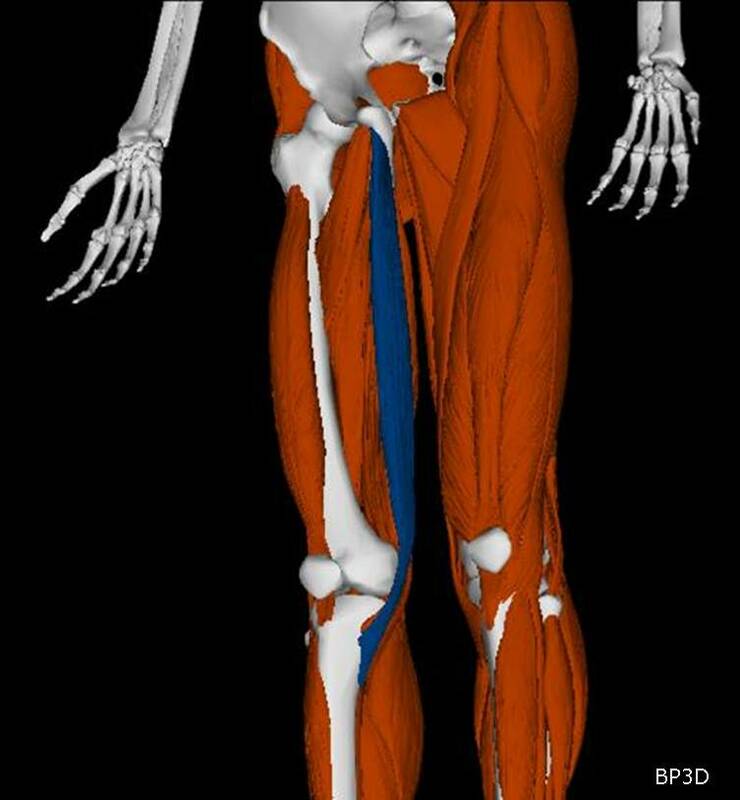 The muscle runs down the medial side of the thigh, connects to its’ short round tendon which runs behind the lower, medial femur. From there, the tendon crosses the knee joint to attach on the top of the tibia bone on the medial and slightly anterior side in an area called the pez anserine. Action – The main action of this muscle is to adduct your thigh if your pelvis is stable. If you thigh is stable, the muscle will act to pull your pelvis down, on the side towards the opposite leg and slightly tilt the pelvis forward. The gracilis is the only muscle that directly supports the medial side of the knee and as such, is a critically important muscle to protect the medial collateral ligament (one of the four main ligaments stabilizing the knee) and the knee joint from traumas that deviate the knee medially. (Think of the football player who is tackled at the knee from the side. The gracilis protects the medial side of the knee getting hit.) The sartorius muscle also crosses the knee near the gracilis but has an action which does not directly support of the medial knee. Diagnosis – Weakness in the gracilis can be determined with manual muscle strength testing, careful observation of knee alignment during walking, running and at rest and other tests. Supporting information can be gained through a detailed history as well as physical examination for neurological, vascular and orthopedic signs. Measurement of gracilis ranges of motion and muscle strength are available with specialized equipment when required for insurance purposes, research or in advanced cases. Functional Implications – When the gracilis muscle is weak, you will not have the strength you should when a) adducting (pulling your thigh inward), b) your knee will be unprotected and possibly unstable medially and c) there will be some degree of difficulty stabilizing the pelvis during one legged activities or even while in the one legged phase of walking/running. If weakness of the gracilis is present while there is simultaneously excessive pronation of the foot, the knee will deviate medially putting stress on the medial collateral ligament. In more advanced or prolonged weakness of the gracilis, the knee can take on a valgus deformity (knock kneed). A) Thigh Adduction (pulling the thigh inward) – Sports that use the motion of pulling the leg inward will suffer when this muscle is weak. Kicking a soccer ball laterally by swinging the leg across the body is a clear example. Taking sharp turns towards a lateral direction or running sideways will suffer. Horse back riding styles that use the thighs to grasp the animal will be impaired. Swimming sports using the ‘frog’ kick use this muscle as does any sport that needs to bring the knees together from a straddle position (gymnastics & dance). Making turns while skiing utilize the gracilis to shift body weight and leg positions side to side. B) Knee stabilization medially – The knee joint has close to zero medial to lateral range of motion under normal circumstances. If the main ligament on the inside or outside of the knee has been stretched, motion will be increased in this plane. The gracilis helps protects the Medial Collateral Ligament (MCL) from being damaged and can play a role in helping to rehabilitate the knee when the MCL has been compromised. Weakness of the gracilis decreases it’s protective and rehabilitative abilities. C) Pelvic Stabilization – Any sport activity that involves one legged stances (walking, running, 1 legged poses in dance, martial arts kicks, etc.) will have less stability, strength and speed when the gracilis is weak. The leg that is weight bearing and has a weak gracilis will tend to experience the top of the pelvis tilts excessively to the same side as the weight bearing leg. This may be experienced as decreased control or balance. Ice skaters and dancer may find that their that one legged spins are impaired. Joint clicking – In the early stages of ligament stretching and excess movement, the bones move out of proper alignment and ride up onto cartilage. Sliding on and off certain parts of the cartilage can cause a clicking sound. With too much pressure on the parts of the cartilage that do not normally experience this, the cartilage can be cut, causing another type of clicking sound. Chronic Weakness – People who experience weak gracilis issues for many years are putting their knees through excessive wear and tear that can eventually lead to cartilage damage, osteoarthritis and potential for surgery. Learn how to test for muscle strength imbalances with education & certification courses offered by the Diagnosis Foundation. Then you can help identify muscle weakness early, when correction takes minimal effort. Next Next post: Target stores sets itself apart with GMO free products. How do you set yourself apart?